Maybe we've taken the Sunshine Law a little too much to heart. Perhaps there are meetings of various agencies of government that it's pointless for someone outside of government to attend. The New York State Department of Transportation (NYSDOT) public forum held Wednesday, March 5 at the College of Staten Island was that kind of assembly. The topical, uh, springboard for the forum--which included a roundtable discussion among a panel of government officials, transportation professionals, and civic leaders--was a presentation entitled "Multimodal Investment Needs & Goals for the Future" in print and Power Point formats. Basically, the presentation is a pitch for additional transportation funding from the Feds. The goals are to accommodate significant projected local population growth, and to respond more aggressively to seriously deteriorated infrastructure and inadequate public transit services statewide. The presentation, delivered by NYSDOT commissioner Astrid C. Glynn and New York Metropolitan Transportation Council Executive Director Joel Ettinger, included the rather startling announcement that the presentation did not include consideration of the services, facilities or operations of either the Port Authority of New York and New Jersey, or the Metropolitan Transportation Authority (MTA). Huh? Why invite the public, when the transportation services we use most are outside the bounds of consideration and, thus, discussion? Following the presentation there was a completely unfocused and inconclusive roundtable which kept returning to the possible impacts, pro and con, of Congestion Pricing; and the public health disaster that is the Cross Bronx Expressway. If not for the commentary of Jonathan Peters, College of Staten Island Associate Professor of Finance--probably the most informed spokesperson for progressive transportation policy in the borough--the forum could as easily have been held in Far Rockaway or Spuyten Duyvil. And when it came time for the public to speak at this public forum, we were instructed not to address specific projects or policy matters but to speak only in the sort of broad, abstract terms--think 'multi-modal,' 'regional' and 'statewide'--NYSDOT used in its presentation. I spoke of the need for a truly functional Staten Island transportation system--adding that such a system can come about only if we stop thinking of Staten Island mass transit as a commuter service. One panelist checked her watch. 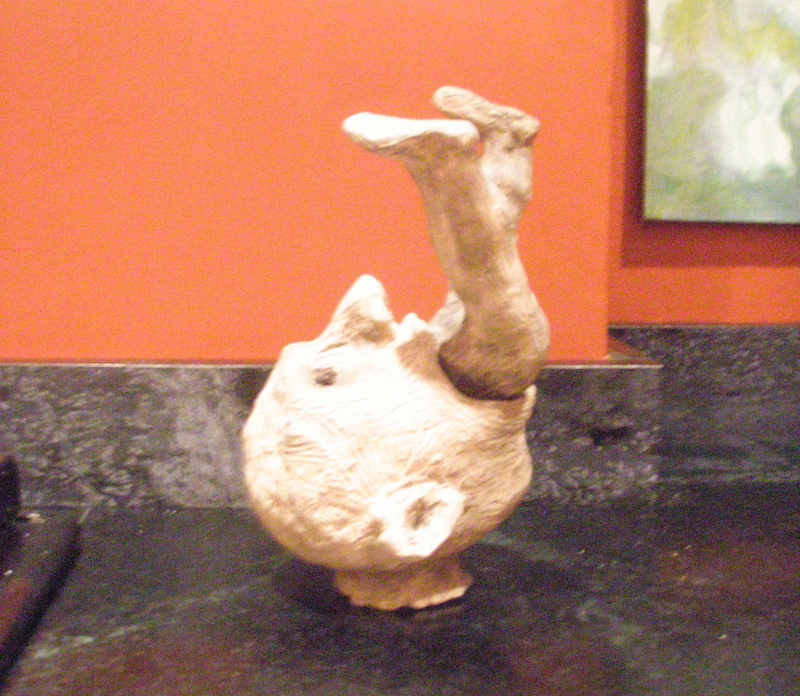 Another barely stifled a yawn. I know there's a lesson here, somewhere . . . If you're exasperated, as I am, at having to scramble your schedule, with one day's notice, in order to attend what could be an important public hearing, let me assure you, I know the feeling well. Happens all the time. It's 6:10 p.m. as I write this; the announcement e-mail was received here only hours earlier, at 3:15 p.m. I'm grateful to the Campaign for New York for informing me; I would have heard nothing otherwise. Here's the e-mail message in its entirety. I will attend and hope as many Staten Islanders as possible will join me. New York State Department of Transportation (NYSDOT) Commissioner Astrid C. Glynn will host a forum Wednesday, March 5, in [sic] Staten Island to focus attention on transportation needs in New York City over the next 20 years. The forum will bve held in the Williamson Theatre at the Center for the Arts, College of Staten Island, 2800 Victory Boulevard. The public meeting will be from 6 p.m. to 8:30 p.m. The forum will focus attention on the next authorization of Federal Transportation programs that fund almost half of New York's transportation investments in highways and transit. Commissioner Glynn will oen the public session with a presentation on NYSDOT's 20-Year Needs Assessment and 5-Year Capital Program. New York Metropolitan Transportation Council Executive Director Joel Ettinger will then follow with an assessment of local impacts. A roundtable discussion by New York transportation experts will then expand on these issues, with a spotlight on the subject of traffic congestion. The panel will be moderated by NYSDOT Chief Engineer Robert Dennison. •Daniel Albert, President, Queens Independent Living Center; •Linda Baran, President and CEO, Staten Island Chamber of Commerce; •Majora Carter, Executive Director, Sustainable South Bronx; •Cate Contino, Campaign Coordinator, NYPIRG Straphangers Campaign; •Allison de Cerreno, Director, NYU-Wagner Rudin Center for Transportation Policy and Management; •David Ewing, Eastern Regional Conference, Council of State Governments; •John Galgano, President, CommuterLink ride-matching service; •Josephine Infante, Executive Director, Hunts Point Economic Development Corporation; •Gary LaBarbara, President, Teamsters Joint Council 16; •James McGowan, Honorary Director, New York State division, Automobile Association of America; •Jonathan Peters, Associate Professor of Finance, College of Staten Island; •Sam Schwartz, NY Daily News columnist and president and CEO, Sam Schwartz PLLC. The roundtable will be followed by a public comment session, giving attendees an opportunity to have a dialogue with the panlists, have questions answered, and raise locally significant transportation issues. The campus can be reached via several MTA bus routes, including the S62/S92, S61/S91, S44/S94 and S59. Strip malls inserted into urban streetscapes--like the one shown below, on Richmond Terrace between Stuyvesant Place and Hamilton Avenue in St. George, Staten Island-- are always a mistake. These mini-malls don't conform to the existing pattern of commercial development. That is, they don't isolate parking in the back, behind a line of stores whose fronts are at the building line established by other buildings on the street. Rather, they recess the storefronts and locate the parking in front, forcing those on foot to enter a parking lot in order to reach the stores. Worse, strip malls in urban settings erode the traditional area of pedestrian safety between sidewalk and roadway, making pedestrian use of the sidewalk contingent on the willingness of the driver to let him/her pass without challenge. In most cases, the pedestrian defers to the potentially lethal automobile. The following photos show the strip mall phenomenon taken to the next logical step: Not content to share the sidewalk with pedestrians for access and egress, drivers who work at or visit this St. George strip mall have taken over the sidewalks, too, forcing pedestrians to walk around parked cars on sidewalks where they, not cars, are supposed to be the prime users. In the winter, when sidewalks get icy, this situation isn't just inconvenient; it's dangerous. And winter is right around the corner. 120th Precinct, S.I. : Why aren't these cars ticketed or towed? 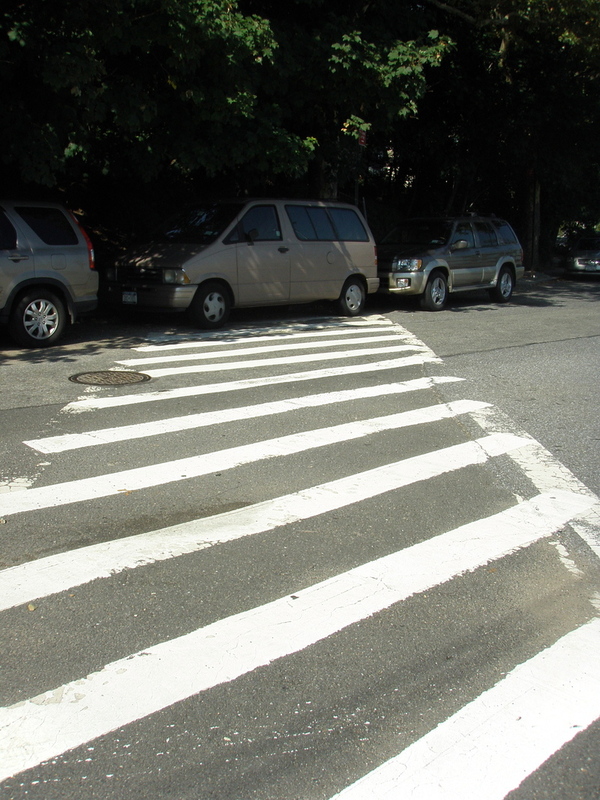 This crosswalk, also at Stuyvesant Place and Richmond Terrace, St. George, Staten Island, is like many on Staten Island; it has a car parked smack in the middle of it. But it's hard to get too exercised over this violation of the law, except in the abstract. 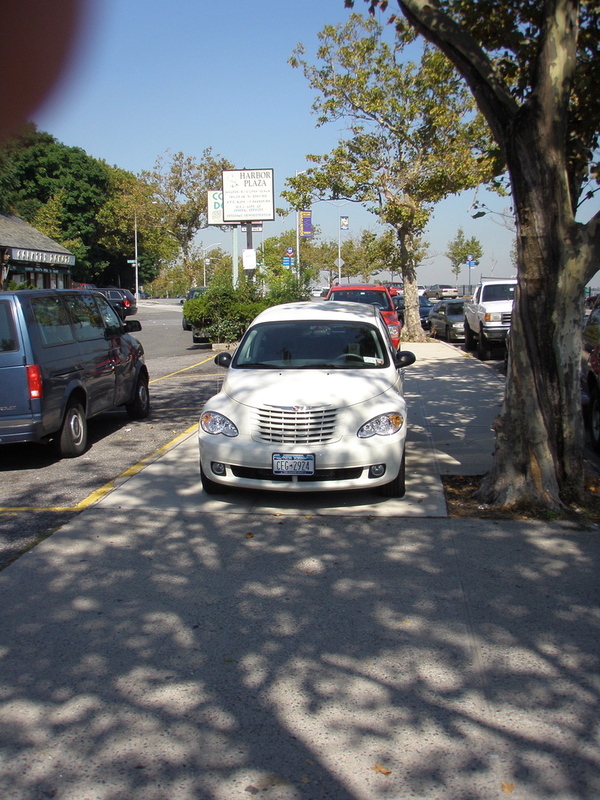 That's because––though it may not be visible in this image––the crosswalk, with or without a car parked in it, leads not to a sidewalk but directly into the center of a stout and stately Sycamore tree, reportedly the favorite of Robert Moses, who planted millions of 'em throughout the five boroughs during his reign. Still, one has to wonder: What were the DOT traffic engineers thinking?